Conduction-cooled (i.e. cryogen-free) magnets designed for x-ray diffraction measurements have the advantage of compact size compared to a conventional liquid helium system, permitting the assembly to be fitted to existing goniometers. A variable temperature insert, typically 2 to 300 K allows for sample rotation in the magnetic field. The system pictured (on left) is of a 5T cryogen-free X-ray diffraction system. An example of magnets used in such systems is also shown (below). Neutron Diffraction magnet systems are characterized by the requirement of having minimum material in the neutron beam path. A vacuum bore and gap in the split pair magnet, with field orientation either vertical or horizontal, avoids any liquid helium in the path of the beam. Variable temperature inserts are often provided, typically 2 to 300K, allowing for sample rotation in the magnetic field. The aperture through which the beam passes are typically provided with windows of thin aluminum. The system shown here is a cryogen free unit for diffraction research studies. To do Ion Cyclotron Resonance measurements the superconducting magnet system must have the following features: High field, moderate homogeneity over a large region sufficient to encompass the ion trap, high temporal stability, and low fringe fields. A low loss cryostat that only requires refilling once a month is also an important feature. For short term routine mass measurements the 7 Tesla, 5 inch room temperature bore magnet system (shown here) has become the most widely used and has gradually replaced the earlier 4.7 Tesla model. This magnet has 10ppm uniformity over a 2 inch diameter x 4 inch long cylindrical volume. The temporal stability is better than 1ppm/ hour. The fringe field is substantially reduced by providing separate superconducting shielding coils. Other designs with higher fields, larger or smaller homogeneous regions with homogeneity to the 1ppm level, larger bores and magnets with passive or active shielding (shown here) have been built. The scanning tunneling microscope (STM) is widely used in both industrial and fundamental research to obtain atomic-scale images of metal surfaces. It provides a three-dimensional profile of the surface which is very useful for characterizing surface roughness, observing surface defects, and determining the size and conformation of molecules and aggregates on the surface. The system shown (lower left) is a 9/11 Tesla, 3.5" bore system. An additional consideration is to keep the cryostat top plate as uncluttered as possible (see top view). This allows the magnet system to be easily supported from the underside of a vibration isolation table and provides maximum working area for the STM insert itself. The other system shown (lower right) is of a 9 Tesla, 5" bore STM system in a bottom loading configuration. The system on the right combines a low temperature Scanning Probe Microscope (SPM) and insert built by NanoMagnetics Instruments with a magnet system built by American Magnetics, Inc. Such systems are available in a variety of styles depending upon the experimental needs which commonly include Atomic Force Microscopy (AFM), Scanning Hall Probe Microscopy (SHPM) or Scanning Tunneling Microscopy (STM). The following paper published in the Review of Scientific Instruments, used an AMI STM magnet system and provides useful information regarding such systems. STM spectroscopy offers unique capability for research in emerging areas of Nanoscience. STM provides real time images of atomically resolved surfaces and is a very useful technique to study local electronic phenomena. The Superconducting magnet based STM systems are being used to perform studies related to Magnetic vortices, Nanoscale inhomogeneity and understanding interplay of Magnetism & Superconductivity. AMI provides custom designed magnet systems to accommodate complex user inserts. The system engineers make every effort to provide low loss, low vibration magnet systems to perform variable temperature STM studies. These magnet systems provide magnetic field in either vertical field or horizontal direction. Other alternatives include 2-axis (shown lower right side photo) or 3-axis magnet system thereby allowing rotation of magnetic field vector. Superconducting magnets in particle accelerators contain, steer or focus the particle beam. They act as focusing devices in key locations and are often used in experimental systems at the target end of the tunnel. Racetrack dipole and quadrupole magnets are normally used to guide the beam because they produce a long region of uniform field axially along the flight path of the particles. AMI has the capability to produce precision wound single conductor Racetrack dipole and quadrupole magnets (see below). A dipole version has two elongated coils opposite each other. A quadropole or quadrupole magnet has four coils symmetrically spaced around the radial bore. Quadrupoles produce a higher degree of field homogeneity and strength as compared to dipoles. The achievable field in magnets of this type is lower than that of comparably sized solenoids wound with the same material. AMI's custom production capabilities are best suited for low volume custom magnets for beam lines. Two such identical systems used in an experimental target area are shown below. The refrigeration cycle of an ADR uses the interaction between the atomic magnetic moments in a paramagnetic material (often a salt) and an externally applied magnetic field. A salt pill is thermally connected to a heat sink through a thermal switch; the entropy is reduced by increasing the magnetic field, thus aligning the spins. When the field is maximized the thermal contact to the heat sink is broken. As the field is reduced the temperature drops as the spins relax towards their normal state. In a cryogenic ADR system 4K or 2K helium is the base temperature and the salt pill can reach temperatures in the 300 mK range or less. Taking advantage of this unique cooling cycle means maintaining the mK temperature stable over a useful period of time to collect data from either a sample or a cooled detector of some sort. This is achieved by slowly and precisely decreasing the magnetic field once the desired operating temperature is reached to offset the unavoidable heat leak into the system. It is therefore very important that the bipolar power supply system used be very stable and posses the ability to ramp very slowly so that it supplies just the right amount of current to reduce the field over time and thus maintain the desired temperature with good stability. AMI provides low current bipolar power supplies with ramp rates as low as 10 μA/minute. Magnets for this application are typically of a low current design. Magnetic shielding is also an important system consideration. An AC susceptibility measurements is a very useful experimental technique in studying magnetic properties of materials. They are especially important to detect magnetic phase transitions and these measurements give insight into the critical state model of type II superconductors. AC Susceptometers are fairly easy to build and are very widely used. The method is based on the fact that mutual inductance of two coils changes if the magnetic sample is placed in one of the coils and the resulting voltage is proportional to the susceptibility of the sample. These measurements are typically performed in presence of homogeneous DC magnetic fields produced by superconducting magnet. The variation in sample temperature is achieved by using a VTI. 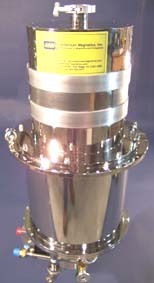 AMI has provided many superconducting magnet systems for use with home made AC Susceptometers. Superconducting gyrotron magnets are used in gyrotron amplifiers that generate millimeter-wave electromagnetic radiation. The electromagnetic radiation produced has become increasingly useful for certain radar applications and for heating plasma in controlled fusion. More recently they have found use in industrial heating applications. Most early superconducting gyrotron magnets were cooled by liquid helium in conventional cryostats; however, now that they are gaining wider acceptance in the industrial market there has been a shift towards conduction-cooled gyrotron magnets (i.e. cryogen-free). Conduction-cooled superconducting gyrotron magnet systems combine ease of operation and low maintenance, which are two essential features for a cost-effective industrial application. As each application requires a unique magnetic solution, American Magnetics Inc. welcomes inquiries for specific applications that use gyrotron magnets. Magnetic separation uses a superconducting magnet that provides the high magnetic field required to produce intense magnetic field gradients at the surface of the separation medium, typically a ferromagnetic mesh. Magnetic separation has been used for such diverse applications as the removal of harmful impurities from drinking water, purification of minerals such as Kaolin, and the separation of red blood cells from plasma. 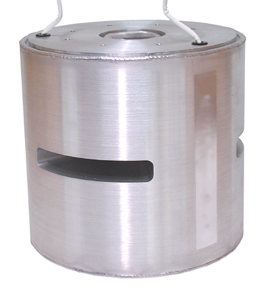 A room temperature bore magnet system provides the housing for the canister that is periodically removed from the magnetic field for back flushing the separated impurities. Industrial or high production systems utilize reciprocating magnetic filter canisters so to one unit is back flushing while the other is processing material. This type of arrangement can provide nearly continuous uptime for long periods. Computer based power supply systems with safeguards, interlocks and limited operator interfaces can be provided for industrial settings such as this. Cryogen free systems are highly recommended to avoid the safety, logistics and special \training issued involved with liquid helium. For levitation of diamagnetic materials a high magnetic field and field gradient product B(dB/dz) is required. Diamagnetic materials are subject to repulsive force in magnetic fields. When such magnetic force counterbalances the gravitational force, the materials will levitate in the gradient magnetic field. By changing the magnetic field direction an increased force is applied. The magnetic levitation produced by this technique provides an ideal equivalent condition to microgravity. This technique is also very useful in growth of protein crystals in microgravity conditions. The system shown has a 16T2/cm product in a 1 inch room temperature bore. The important design feature for stable levitation is the field profile in the radial direction that must increase with increasing distance from the magnetic axis. A superconducting magnet offers superior performance to a high field resistive magnet because it has high temporal stability and no vibrations. Additional research to use this artificial gravity capability on chemical processes shows promise by achieving improved results with smaller sample volumes and smaller processing equipment sizes. Increased liquid holdup time through a catalytic trickle-bed reactor is one example. The magnet below was used for this purpose. The system pictured (left) is a 9.5 Tesla Levitation System producing 16.6 T2/cm within a 1" room temperature bore. The system (below) has a 2" inch room temperature bore and produces 9 Tesla with > 5.75 T2/cm. AMI has designed, manufactured and delivered a number of different types of custom magnet systems for commercial or research applications in the medical field. Most projects of this type are sponsored by corporate concerns requiring non-disclosure agreements to protect proprietary information within this highly competitive arena. AMI treats the trust of our customers very seriously and welcomes the opportunity to explore mutually beneficial long term relationships. The medical MRI unit to the right projects a 0.1 Tesla homogeneous field 20cm above the top plate of the cryostat. Although conventional cryostats with liquid helium and nitrogen are most common, it is also possible to conduction cool with a mechanical refrigerator as shown. Nuclear Magnetic Resonance magnet systems are in such widespread use that their features have been perfected to a greater extent than any other superconducting magnet system. They are characterized by very high homogeneity; temporal stability and long cryogen hold times to the extent they may be treated almost like permanent magnets. The sensitivity of the NMR measurement increases with field strength and that has inexorably increased field strength over the past 35 years from 5 Tesla to 21.5 Tesla as higher performance superconductors have been developed. 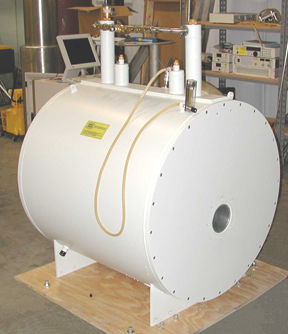 American Magnetics specialize in custom NMR magnet systems that fall outside the range of the magnets supplied with standard model NMR spectrometers. Examples are those magnets used for specialized experiments requiring modulation coils or unusual homogeneous volumes. 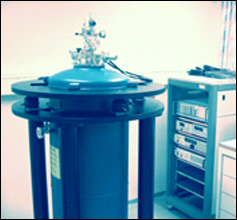 In addition those magnets used for solid state NMR or a combination of MRI and MRS are within our area of expertise. Typical specifications are up to 0.1ppm homogeneity from the superconducting magnet alone and field stability of up to 0.1ppm/Hr.